It is my greatest pleasure, on behalf of the Organizing Committee, to welcome you to attend the Central and Eastern Europe Decommissioning & Waste Management Conference 2016, which will be held on Dec 8-9th, Sofia, Bulgaria. This event is the only international and commercial nuclear decommissioning and waste management event focusing on the Central and Eastern Europe (CEE) region such as Bulgaria, Slovakia, Lithuania, Ukraine, Czech, Romania and etc. In the European Union, a total of 133 NPP units are currently in operation, about one third of them will have attained their end-of-operation and will be in decommissioning by 2025. After the disaster in Fukushima, Germany, one of Europe’s biggest operators of nuclear power, shut down 8 out of its 17 reactors and committed to close the rest by 2022. Central and Eastern Europe (CEE) seems to be recently accelerated by decisions of several governments in Europe to shut-down operation of some nuclear power plants from different reasons. Between 1999 and 2013, the EU has pledged to provide financial assistance totaling €2.85 billion to Bulgaria, Lithuania and Slovakia. Moreover, European Union will stimulate export of know-how to other countries, especially those having a large nuclear program, and promote highest safety level, from legislation, strong regulatory oversight to the minimization, sorting and characterization for the large volumes of waste. This growing market creates a potential for new activities, with highly skilled jobs in an innovative field, involving high-level technologies. We are pleased at your interest and appreciate that almost all important institutions and companies, active in Central and Eastern Europe or European nuclear power engineering and or decommissioning sector, are taking part at our conference and delegated their most responsible persons and experts to be here. The conference will offer you a comprehensive coverage of the nuclear decommissioning and waste management markets with fresh project updates and various case studies across CEE region. Meanwhile, for those who are keen to find new investment opportunities or strengthen their presence in the global & regional market, especially the Central and Eastern European market, this two days congress will provide plenty of opportunities to meet your future partners. I am looking forward to seeing you in Sofia, Bulgaria! 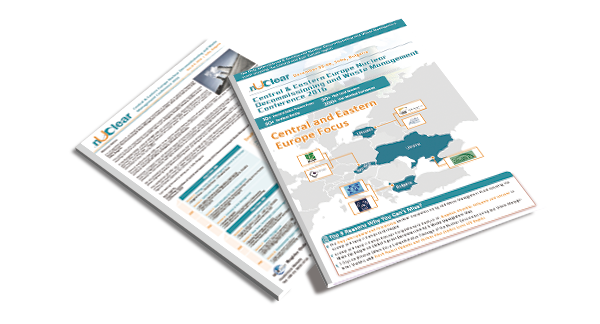 In the event brochure, you will know the 2-day conference offer you a comprehensive coverage of the nuclear decommissioning and waste management markets with fresh project updates and various case studies across CEE region.